This briefing paper summarises the NHS Confederation report ‘Investing in emotional and psychological wellbeing for patients with long-term conditions‘ and describes how primary and secondary health services can improve patient outcomes, while reducing the overall costs of care for the NHS. A close relationship exists between long-term physical conditions and mental health and wellbeing. Long-term physical conditions often affect a patient’s mental health, and psychological wellbeing can also have an impact on the effectiveness of treatment for, and a patient’s ability to manage, long-term conditions. Despite this, many individuals do not receive care that addresses both their physical and psychological needs. There is a growing body of clinical and economic evidence supporting investment in psychological services as part of the treatment for long-term conditions – people with long-term conditions use disproportionately more primary and secondary care services and are more likely to develop depression than the rest of the population. 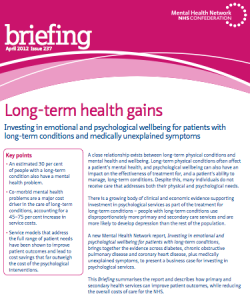 The report ‘Investing in emotional and psychological wellbeing for patients with long-term conditions‘ brings together the evidence across diabetes, chronic obstructive pulmonary disease and coronary heart disease, plus medically unexplained symptoms, to present a business case for investing in psychological services. An estimated 30 per cent of people with a long-term condition also have a mental health problem. Co-morbid mental health problems are a major cost driver in the care of long-term conditions, accounting for a 45–75 per cent increase in service costs. Service models that address the full range of patient needs have been shown to improve patient outcomes and lead to cost savings that far outweigh the cost of the psychological interventions.